The current structure of the Regional Transportation Authority (RTA) has caused frustration for the riding public, transit agencies and policy makers. On Tuesday Dec. 3rd University of Illinois-Chicago’s Great Cities Institute organized the “Future of the RTA” public forum. A panel of experts participated in a free form dialogue about the need for transit reform as well as their vision for the ideal, world class transit system. The “Future of the RTA” panel consisted of the following five transit authority experts: Chicago Metropolitan Agency for Planning (CMAP) executive director Randy Blankenhorn, Metropolitan Planning Council (MPC) director Peter Skosey, Center for Neighborhood Technology’s public policy advocate Jacky Grimshaw, Metropolis Strategies executive director Frank H. Beal, and Urban Transportation Director Stephen E. Schlickman. As the financial and administrative body over the three main transit agencies in Metropolitan Chicago and Northeastern Illinois, CTA, Metra, and Pace, the RTA is the third largest transportation network in North America and has served approximately 8.3 million people throughout the six-county region since 1974. Since its inception, the transportation network faced formidable challenges in its funding streams. The sales tax is the primary revenue source for the RTA. In 2008, Illinois legislators passed the Illinois Public Act 95-0708, which increased the RTA sales tax in Cook County by 0.25 percent and 0.50 percent in the surround counties, according to a Regional Transit Authority-Mapping and Statistics report. Yet in the past two decades, as Peter Skosey points out, the city of Chicago has cut capital spending in transit by 25 percent. These source revenue challenges are symptomatic of the larger problems of the current RTA formula. The panelists’ other key criticisms levied against the RTA are the transit system’s lack of efficiency to meet the needs of Chicago and its rapid globalization, the disadvantages of a multi-agency structure, and the unequal distribution of service routes and stations throughout Illinois. Grimshaw said that the lack of transportation service outside of Metropolitan Chicago impedes the employment options for low-income communities, as suburban cost of living and automobile prices increase financial pressure on individuals. For Carolyn Pomykala, native Chicagoan and RTA user, her commuting challenges are complicated by the current transit system’s limited service routes. “Now that I am carless by choice I find that trying to integrate Metra and Pace to my ridership is interesting to say the least,” Pomykala said. 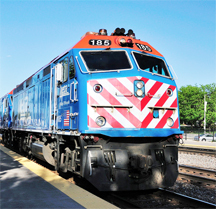 When trying to visit a friend in Mundelein, Pomykala found difficulties in finding other transit options and information about service routes. Although the “Future of the RTA” panel expressed points of contention as to the make-up of the ideal, world class transit system, they were unified about the importance of the CTA, Metra and Pace to overcome political divisions in order to make transit reform possible.